Building on elements of the first game, Q-Games brings corrosive acid and creative lighting tricks to bear in PixelJunk Shooter 2. 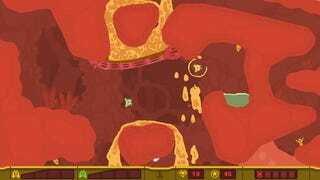 Shooter 2, the first true sequel in Q-Games' PixelJunk series, picks up where the first game left off, plunging the player into the belly of the beast, which is incidentally the name of the first level I played through at Sony's E3 2010 booth. New game mechanics surface immediately as I find my ship inside the digestive tract of the giant beast that swallowed me whole at the end of the original game. Corrosive acid pours from various orifices and pools in the valleys of the creature's innards, its touch slowly eating away at my ship's armor until washed away with soothing water. The goal remains the same here: Rescue the trapped scientist by any means necessary. Enemies pop out of the walls, firing projectiles I dodge with varying degrees of success. Unlike water, which allowed shots to pass through, the acid dissolves my bullets, so shooting through it is out of the question. Furthering my troubles is the fact that shooting the creatures insides causes more acid to ooze forth, making shooting more dangerous than ever. While water washes the acid from my ship, it doesn't remove it from play on contact, as it did with lava in the first game. Instead, when water and acid mix, they form a slippery gas that fills the area. When your ship hits the gas it becomes nearly impossible to steer. In order to navigate, I must use the ship's grapple to hook myself onto small, circular nodules, spinning around them and releasing like a slingshot in the direction I want to move. It takes a little getting used to, but soon I find myself making it through the final exit, with most of the scientists safely onboard. I don't fare quite as well in the second level I played. Light is another element added in PixelJunk Shooter 2, and it doesn't play nice. The area I find myself in next is comprised of light areas and dark areas. I'm safe enough in the light, able to rescue scientists normally, but in the darkness I can't grapple them, no matter how hard I try. To make matters worse, motes of shadow gather as I traverse the darkness. If I spend too much time without light, those shadows converge on my ship, destroying it instantly. My first weapon in the fight against darkness turns out to be a timed switch that inverts light and dark areas, allowing me to pick up stranded scientists previously lost in the inky blackness. Soon I find a ball of light, growing out of one of the area's walls. Latching on I carry it with me, illuminating the passageways, though each time it hits a wall pieces fall off, leaving it dimmer and dimmer. I carry the light ball to some scientists and pick them up, but once I drop the ball I can't grab it again. As the Sony rep urges me on I make a mad dash for the light, but the shadows converge, and my ship explodes. After thoroughly enjoying the first game and tasting what the next has to offer, I'm eagerly awaiting the fall release of PixelJunk Shooter 2. I just hope I can keep a handle on my fear of the dark long enough to finish it.